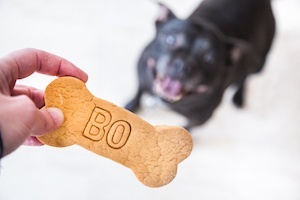 Treats are recommended by vets and training experts as a positive way to encourage good behavior from your pet. Thanks to a wide range of interactive dispensers, you can educate and entertain your pet even when you're not at your pet-friendly Springs luxury apartment home. Here are some of today's top choices for treat dispensers, along with suggestions for healthy and delicious treats to fill them with. Which one suits your pet's personality? 1. KONG is an innovative company that makes pet toys from their proprietary, non-toxic rubber that stands up to endless chewing. The KONG Classic is a pioneer in the category of treat dispensers. 2. The Senses 2.0 Food Tree from Catit lets your cat indulge her natural hunting instincts. Three levels of varying difficulty keep cats challenged, and the base has a built-in tray that prevents stray treats from becoming scattered across the floor. 3. CleverPet's Hub is more expensive than most treat dispensers, but the sleek and sophisticated system is well worth the price. The Hub uses lighted touchpads to create puzzles that your pet must solve to get the kibble. Difficulty increases intuitively based on your pet's progress, and you can control the Hub through the CleverPet mobile app. 4. With the Pawbo Life WiFi Pet Camera, it's like you never left home. Watch your pet's every move on HD live video with wide-angle lens and digital zoom. You can also hear and talk to your pet, feed him treats and even play games such as Laser Pointer and Pawbo Catch, all from your phone. 5. What if your schedule keeps you away from home past meal time? Feed and Go includes six trays for wet or dry food, treats or meds that are dispensed on a one-time or regular pre-set schedule. Check on your pet from the built-in webcam, and record a message “calling” your pet over when it’s time to eat. What pet doesn’t love kibble? Many pet dispensers have adjustable openings to accommodate different sizes of this favorite treat. Another popular choice is peanut butter, but choose a natural, unsalted brand that doesn’t contain xylitol, a sweetener that can be toxic to dogs. Other options include oat cereal, chicken or turkey with skin and fat removed, or diced apples, pears, carrots and berries. You can also find a number of easy recipes for DIY healthy dog treats online. Choose a dispenser that’s easy to clean. The more difficult it is to clean, the less likely you are to use it. Treats should never serve as meal replacements. Consult your vet to make sure you’re not overfeeding your pet. Treat dispensers are a great source of entertainment and activity for your pet, but be sure he’s getting regular walks and other forms of daily exercise. Naturally, when you’re home, be sure to share some quality time with your pooch at our Springs off-leash dog parks.